Warning! Do You Have a Tire Failure Strategy? 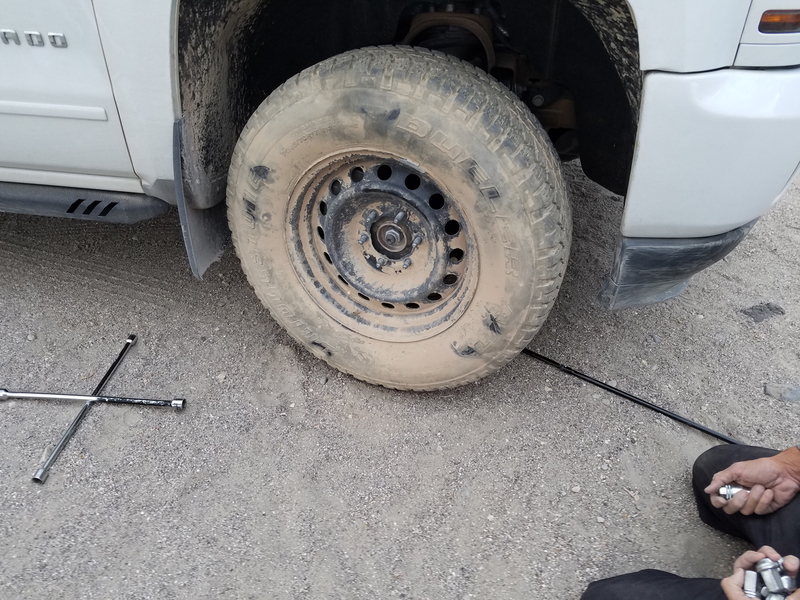 Overlanding, 4×4 trainer and back country adventurer Tom Severin from Badlands Off Road Adventures offers some excellent strategies to handle those inevitable tire failures we all encounter. Tires are generally the number one cause of off-road driving problems. Tires, by their nature, take a lot of abuse while off pavement. Trails are anything but smooth. Stuff happens! A stick jams into the sidewall; a rock that is ideal to skip across a lake slices the sidewall like butter; or a decent size rock hiding behind the bush on a turn cuts the sidewall between the rock and the rim. The probability of tire damage increases when you add into the mix a fatigued or distracted driver. When tire damage happens, try fixing the tire first. Meaning, don’t just automatically swap in the spare. Do that, and you’re left with no backup. Many times, a punctured tread or minor sidewall puncture can be addressed quickly. One or two plugs solves the problem, allowing the trip to resume. If you can’t fix the tire, you now have no backup should another tire be damaged. Now you need your tire failure strategy! Having a tire failure plan (strategy) before you leave home is the key. Don’t leave home with bad tires! Period. You hit the trails with even one damaged tire, and you’re asking for trouble. You may complete your ride, but why start a trip risking a flat tire? A good strategy is to choose wheeling buddies based on their vehicle’s lug pattern and tire size. In a worst case, you use can use their spare. In fact, wheel with other similar vehicles so you have other spare parts you might need as well. If you know your adventure will be difficult and remote, and you have had more that your share of tire problems, pack a second spare, either mounted on the rim or by itself. Store it on the top of your vehicle. This strategy gives you two spare tires – more than enough for the typical 4WD trip. Another (last resort) strategy is to buy an inner tube that fits your vehicle’s tires. (Harbor Freight and other retailers carry them.) The tube is your deep, deep, back up line of defense. The best strategy is to try to fix the damaged tire. Some minor cuts can be plugged, allowing the trip to continue without losing too much time. Use your plug kit; put a new valve stem in if was damaged, or re-seat the bead. Use one of the spare lug nuts in your kit when you lose one in the sand changing tires (smile). This bead will not hold air with stuff jammed in it. Can’t fix the tire? You have some decisions to make. If you cannot fix the tire, put on the spare and head home or find the nearest tire store and replace the damaged tire. You’ll miss part and perhaps the rest of the trip, but you’ll also enjoy the peace of mind that comes with riding on good tires. Don’t want to miss the rest of the trip? Agree on a meeting location and time frame for rejoining your convoy. If the area is too remote or unknown to you, see if you can negotiate with the group to camp and wait for you. And by the way, good radio communications (HAM and Sat phones) really help in these situations. Now, better late the sorry, check the lug pattern and tire size of all the rigs. Maybe you will get lucky and discover that tires can be swapped between Jeeps, and even between a 4-Runner and a Chevy pickup. Good chance you will not have any more problems but if so, you have access to another spare tire. Who knew a spare from a 4 Runner would fit a Chevy PU? Always watch for tire-getting obstacles. Four wheeling off pavement by its nature is tough on vehicles. As such it requires your undivided attention. While focused on the trail ahead make sure you’re watching for hazards that can damage your tires. We don’t experience flat tires in town as frequently as we used to (years and years ago). Going off road is a different matter. You must be cognizant of the condition of the trail and surrounding areas. 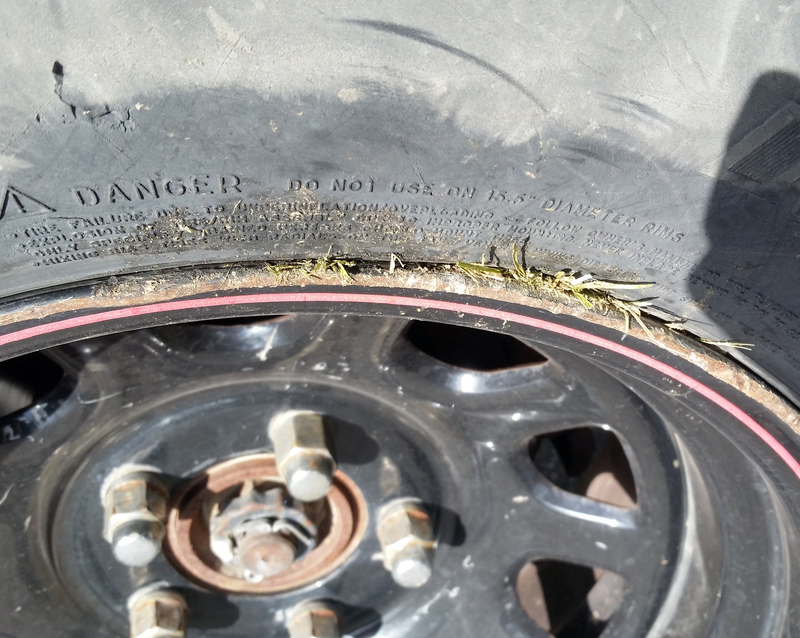 Any time you see a tire-damaging obstacle, slow down and try to steer around it if you can safely and responsibly. Resist the temptation to hit the gas and plow over or through it. You could damage more than just tires. Sharp-edged rocks are common in many mountainous areas; watch for them! Sidewall issues, like any breakdown, require you to evaluate the situation and make a decision. Can you quickly solve the problem and continue on? Or do you put on your spare and plot the shortest route to a tire store? The correct decision depends on the circumstances you’re facing. And each trip is unique. Spend some time before each excursion imagining how you’d handle a sidewall or other tire damaging issue. Doing so will help make that decision easier, should the need arise. Just put “tire strategy” on your trip planning list and you’ll be a lot happier in the end! Tom Severin is an International 4-Wheel Drive Trainers Association© certified professional 4WD Trainer and a Wilderness First Responder (WFR), and President, Badlands Off Road Adventures.